The above shot came about while I was in Chicago teaching a workshop. 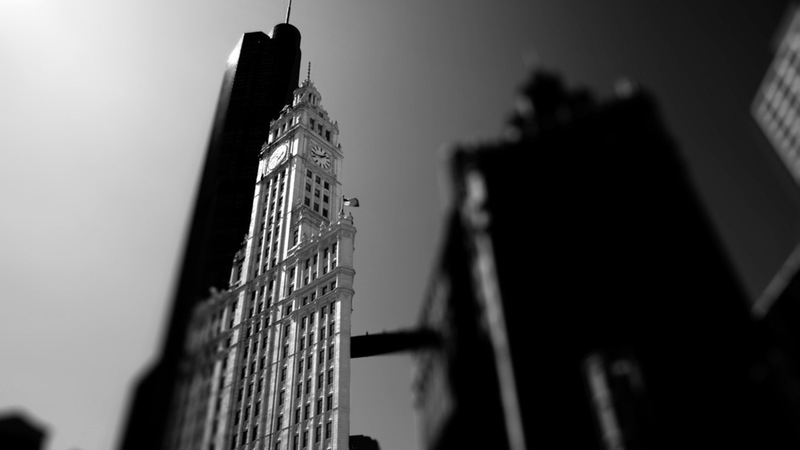 The historic Wrigley building with the Trump tower looming behind it struck me as an interesting subject for a hyperlapse, especially because of the shape of the Wrigley building, which makes it look wider or narrower as you move from one side to the other. Because I didn't have time to do a proper hyperlapse using a tripod, I decided to do an experiment and do it hand-held. I figured that I could always stabilize it in post. After stringing them together into an ultra-short hyperlapse (at 30fps this wasn't even a quarter of a second of footage), I slowed the resulting clip down to 2% speed in Fincal Cut Pro, using the "optical flow" setting. Normally used for slowing regular footage down to create slow-motion, optical flow interpolates between the existing frames to create new ones. In this case, since I went from 100% speed to 2%, the algorithm has to make up 50 frames between each pair of existing frames. Sounds like a bit of a stretch, but the result was a surprisingly smooth hyperlapse. Granted, the shapes of a lot of the buildings were doing a weird kind of morphing that is typical for this method, but the central part of the frame was remarkably stable. In fact, some experimenting showed that it became more stable the less images I used to start with. Of course there was a limit to this, because with too little initial images the morphing effect gets out of control. But I decided that the morphing could also be used as a creative effect instead of trying to avoid it altogether. What's more is that the whole thing had a kind of slow motion feel to it, rather than the nervous, jittery feel that most hyperlapses have. So far I'd just been using the unprocessed RAW images though. I figured a more stylized look might work better here, so I did some processing on the images in Aperture to bring out some nice crisp contrasts and details. However, all of that detail proved to make it a lot harder for Final Cut Pro to transition between the individual images, and I was getting some crazy morphing effects again. This happened mostly on the left and right side of the frame, since that's where the individual images were most different from each other. The solution was to apply a tilt-shift blur to the initial 7 image sequence, blurring the left and right side of the frame. The blur makes those areas much more uniform. The software has a much easier time interpolating soft, blurry areas than areas with lots of detail. The central part on the other hand stays relatively consistent throughout the 7 frames, so the optical flow algorithm does quite a good job there. Of course the blur has to be applied before the time stretching, otherwise it will have little effect. Applying the blur after the time stretching only hides some of the excessive morphing, but it will still be distracting. This is a fun technique to create smooth hyperlapse shots with relatively few images, if you don't mind the morphing effect. There are limitations of course. If large parts of the image change too much over time, there's no way FCP can create smooth and consistent motion from them. Although I haven't tried it yet, it might also be worth experimenting with plugins like Twixtor or Kronos, since they're made specifically for time stretching. As always, it's a matter of experimenting to see how you can achieve the best results.